and delimiter separated values (e.g. csv, tsv) files. 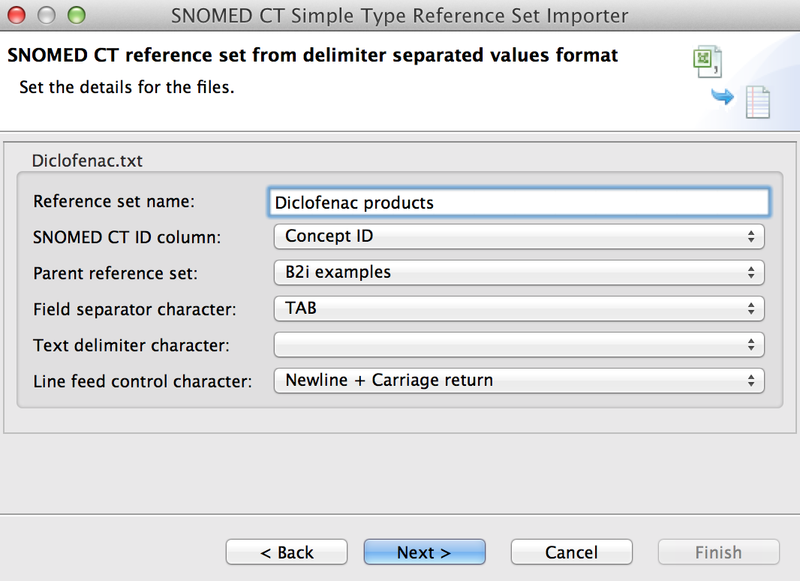 To import reference sets from SNOMED CT RF2 files go to File > Import... in the main menu, select Snow Owl > SNOMED CT Reference set from RF2 from the list, and hit Next. Delta: All component versions created since the previous release. Only components that were changed or added are included. Delta versions are the fastest way to update your reference sets. 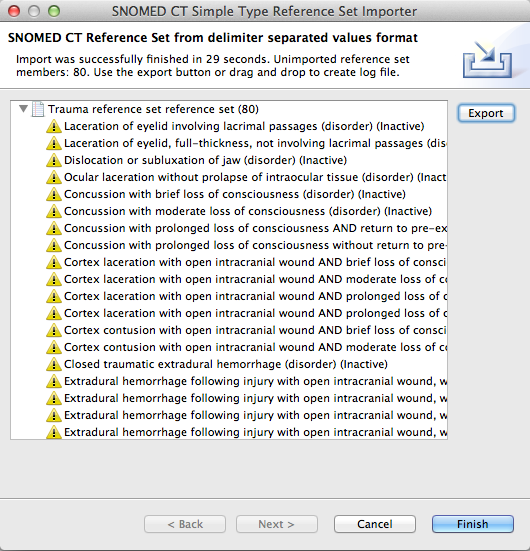 If you are working with a standalone version of Snow Owl the SNOMED CT release only the delta import is enabled. Snapshot: Most recent version of the reference set. If you don't work with historical information, the snapshot release might be sufficient for your needs. Full: Every version of every component ever released. The full historical information of the reference set is included. Create versions for each effective time: This option is only available when importing a full release. It creates a separate version for each release, which allows to switch between versions, for example if you want to work with older versions. If you run the import without creating versions, you will still be able to see historical information in the History view, but won't be able to switch between versions. Check one of the boxes to select a version, and hit Next to proceed. On the next page, you need to select the reference set file you want to import. Click the Add... button to select your file. In this way, you can import multiple reference sets from multiple files. In some cases a single file can contain multiple reference sets, this is also supported by the wizard. If you want to exclude a reference set from the import — for example if it was stored in the same files as other reference sets you do want to import —, uncheck the box next to it. Click Finish to start the import. A status bar will keep you updated on the import process, which should only take a short time. 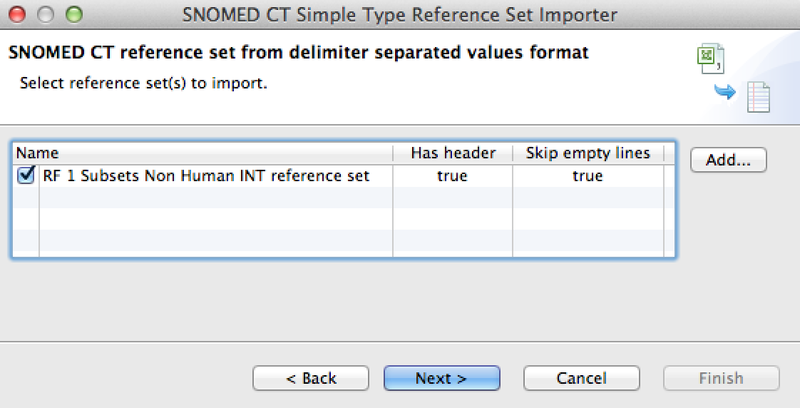 Subsets in RF1 format can also be imported, they will be transformed to a SNOMED CT RF2 simple type reference set. Only the concepts from the RF1 subset that are found in the current terminology will be imported; new concepts are not created as part of the RF1 subset import. Use the Add button to find the spreadsheet you want to import, and hit Next. 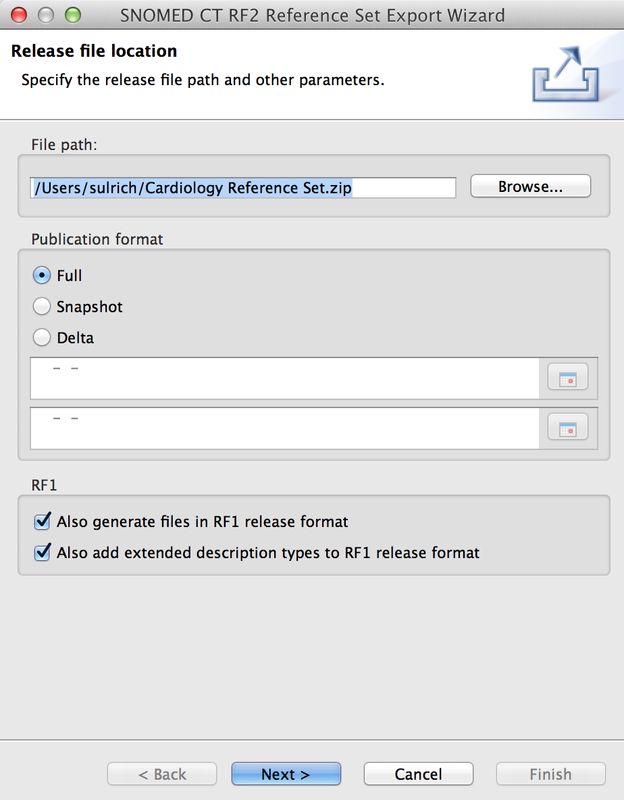 Reference set name: The name of the RF1 file is used by default, but a different name can be entered. SNOMED CT ID column: This column should refer to the column in your RF1 file with the concept IDs. If this is not the case, pick the correct header from the drop-down list. Parent reference set. The selected parent reference set will determine where the file will be saved after the import. For example, if you chose B2i examples as a parent reference set, you will find your file in the B2i examples folder of the Reference Set view. If you don't make changes, the file will be saved in the folder for simple type reference sets. Field Separater character, Text delimiter character, Line feed control character: The settings for these fields correspond to the IHTSDO format for RF1 subsets. If you need to change this for your particular file format, please do so. Hit Next to run the import. The import creates a regular RF2 Simple type reference set that will be added to your Reference Set view. After the import, you will be presented with a log of the import. To review the members that could not be imported click the triangle in front of the file name (see screenshot below). If you want to save the log for future review, mark the file, and click the Export button to create a text file. Alternatively you can simply drag and drop the file into a folder, e.g. on your desktop. Hit Finish to close the dialog. Besides the standard RF2 format, Snow Owl also supports importing reference sets from spreadsheets (e.g. Microsoft Excel) and delimiter separated values (e.g. csv, tsv) files. 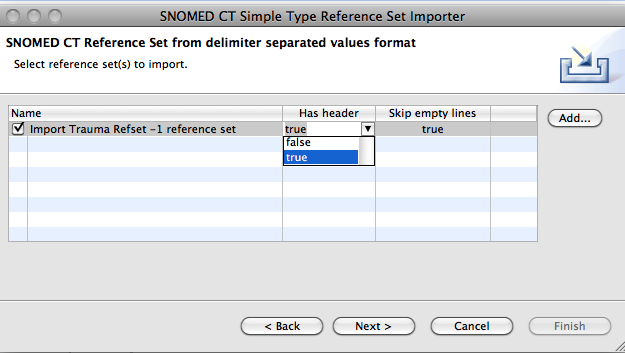 To start the import wizard go to File > Import... and select Snow Owl > SNOMED CT Reference Set from delimiter separated values and hit Next. Use the Add button to find the spreadsheet you want to import. You can add additional spreadsheets the same way. If your file has no header or empty lines, you need to adjust the settings by clicking on the text and selecting true or false from the drop-down list. Hit Next. On the next page, you can specify the file name and select the parent reference set. The selected parent reference set will determine where the file will be saved after the import. For example, if you chose B2i examples as a parent reference set, you will find your file in the B2i examples folder of the Reference Set view. The SNOMED CT id container column should refer to the column in your spreadsheet with the concept IDs. If this is not the case, pick the correct header from the drop-down list. After the import you can review the members that were imported. In case some members were not imported, you can click the triangle in front of the file name (see screenshot below) to get further information. If you want to save the log for future review, use the Export button to create a text file or simply drag and drop the file into a folder, e.g. on your desktop. Hit Finish to close the dialog. 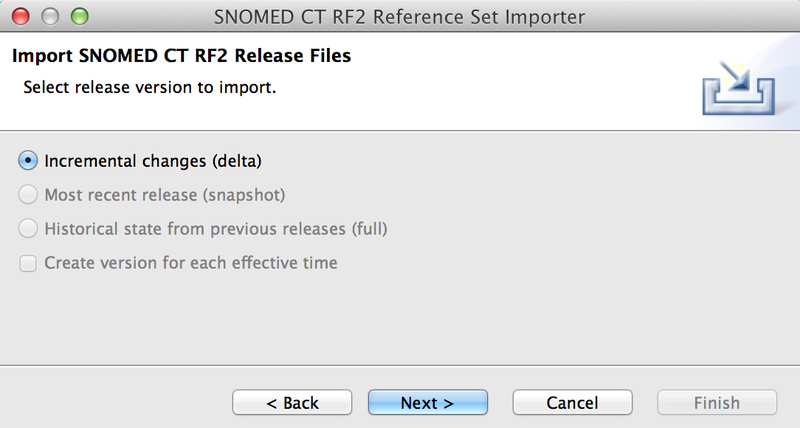 Snow Owl supports exporting a reference set in SNOMED CT RF2. 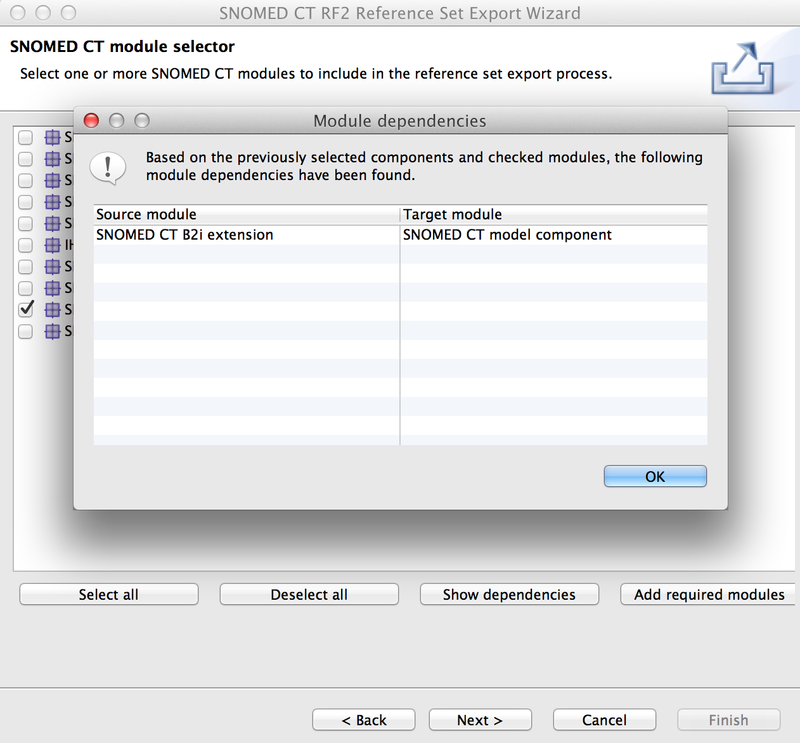 The SNOMED CT Terminology publication wizard will assist you in exporting the file. You can export a reference set either from the reference set editor or from the reference set view. To export from the reference set editor, open your reference set in the editor, and click on the Export reference set to RF1 and RF2 button in the top right corner of the editor. To''' export from the reference set view' , right-click on a reference set in the view and select ''Export reference set to RF1 and RF2 from the context menu. File path: Click on Browse to specify the file name and file location. If the file already exists, you can choose to either overwrite it or append to it. Publication format: You can select between full, snapshot, or delta export. Further information about the different publication formats can be found in the section about Importing reference sets in SNOMED CT RF2. For a delta export, it's possible to specify a time range. Use the calendar icons to set the time range values. On the following page, you can select the modules for export. 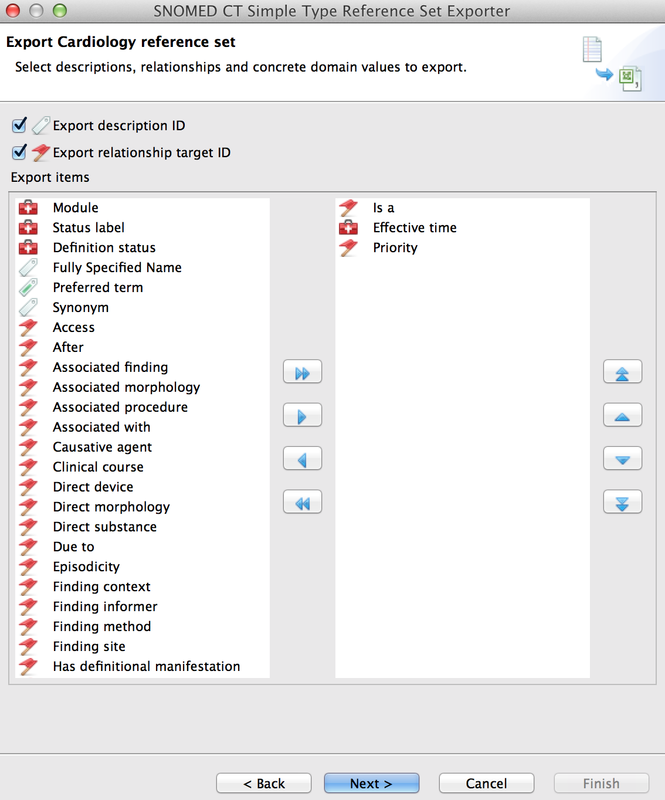 When selecting a particular module to export, the export wizard supports the addition of the dependent modules. By adding the dependencies the export output will be universally valid, and can be used in other systems. Check the boxes to select the modules for export. Show dependencies displays dependent modules in a separate window for review (see screenshot). Add required modules automatically selects dependent modules for the export. Hit Next to start the export. Once the export is finished, you will be presented with a hyperlink to the exported file. Click the link to get to the file, or Finish to close the dialog. You can export complex maps in SNOMED CT RF2 format the same way as described in the section about exporting reference sets. 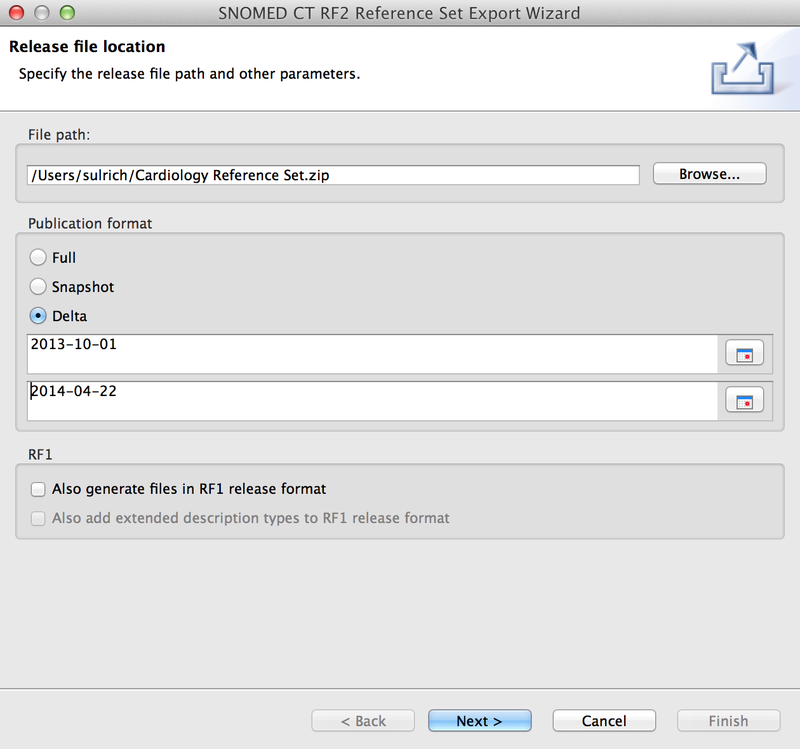 In addition to RF2 Snow Owl supports exporting a reference set in SNOMED CT RF1. The exported file contains both release formats (RF1 and RF2). The export is similar to the one described in the section about RF2 export]. To generate an RF1 export, check the corresponding box on the first page of the wizard (see screenshot). You can also add extended description types to this release format. Once the export is finished, you will be presented with a hyperlink to the exported file. Simple type reference sets can be exported as a delimiter separated text file. Delimiters are characters (e.g. comma, space) that are used to separate different fields in plain text. It's useful to create delimiter separated text files if you want to import your data into other applications, e.g. into Microsoft Excel, where they can be displayed in a spreadsheet. 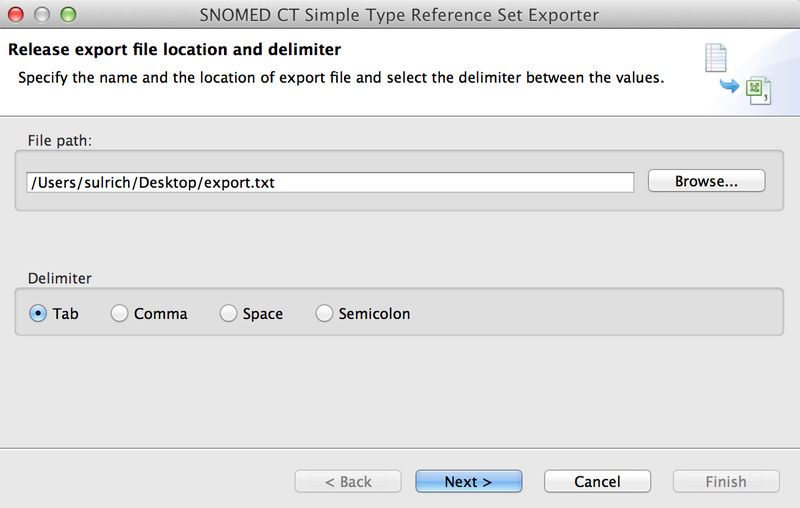 The SNOMED CT Simple Type Reference Set Exporter will assist you in creating a delimiter separated file: Click on the toolbar button of the reference set editor and select Export reference set delimiter separated values format. Alternatively, you can right-click on a reference set in the Reference Sets View and open the wizard from the context menu. On the first page of the wizard, you need to use the Browse button to specify the file name and location. If the file already exists, you can choose to either overwrite it or append to it. Choose a delimiter value, e.g. comma, tab, semicolon, or a character of your own choice. Hit Next to proceed. On the next page, you will be presented with the components that can be exported on the left side. Select the concept attributes you want to export, and use the blue arrows to move them into the boxes on the right side, or back if you want to unselect a component. You can also change the order of the components with the up and down buttons. Hit Next to start the export. After the export you can use the hyperlink to the exported file or hit Finish to close the window.